The growth of fiber optics has taken off in recent years. Major telecom and tech companies are installing fiber optic cables in cities all over the country to bring high speed internet to residents and update the aging infrastructure of the U.S. What does this mean for cable installation? Cords - and a whole lot of them. With this growth comes a need for reliable and sturdy solutions for those charged with installing the massive amount of cables needed to bring our infrastructure up to speed. VELCRO® Brand Products are the go-to tools for each step of the process, from the transportation and installation to the organization of cords. Specifically, VELCRO® Brand ONE-WRAP® rolls and ties are the perfect tools for the job. 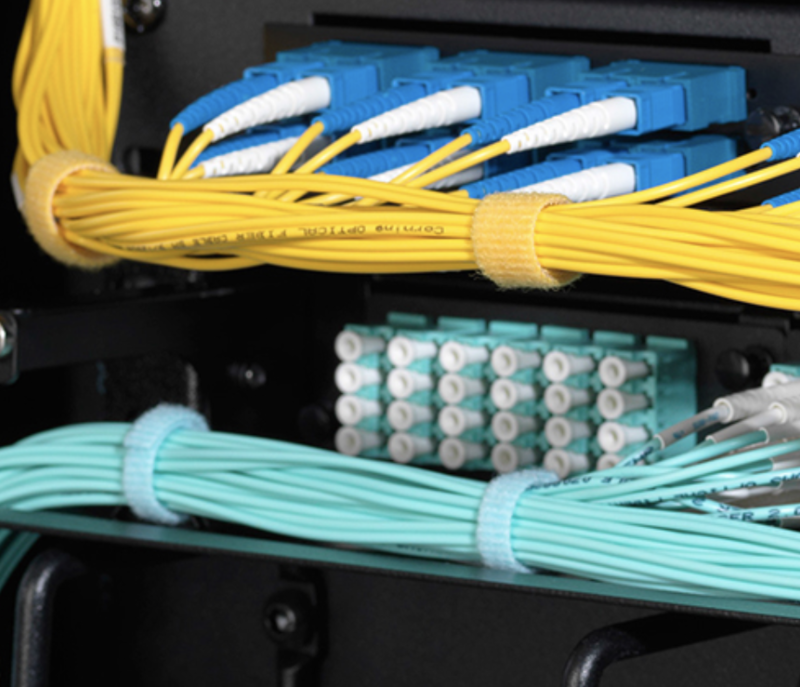 ONE-WRAP® ties are pre-cut, making cable management quick and easy. Their slotted head design ensures the strap stays with the cord and tightly secures bunches of cables. ONE-WRAP® rolls can be effortlessly cut (even with household scissors!) to any custom length and are available in a number of different widths, allowing installers to truly customize their cord management system. ONE-WRAP® solutions are also available in fire-retardant, water- and chemical-resistant options to meet strict safety and building compliance codes. They are also eco-friendly, as they can be used time and time again, unlike one-time-use plastic ties, and they are made without potentially toxic chemicals, like BPA. 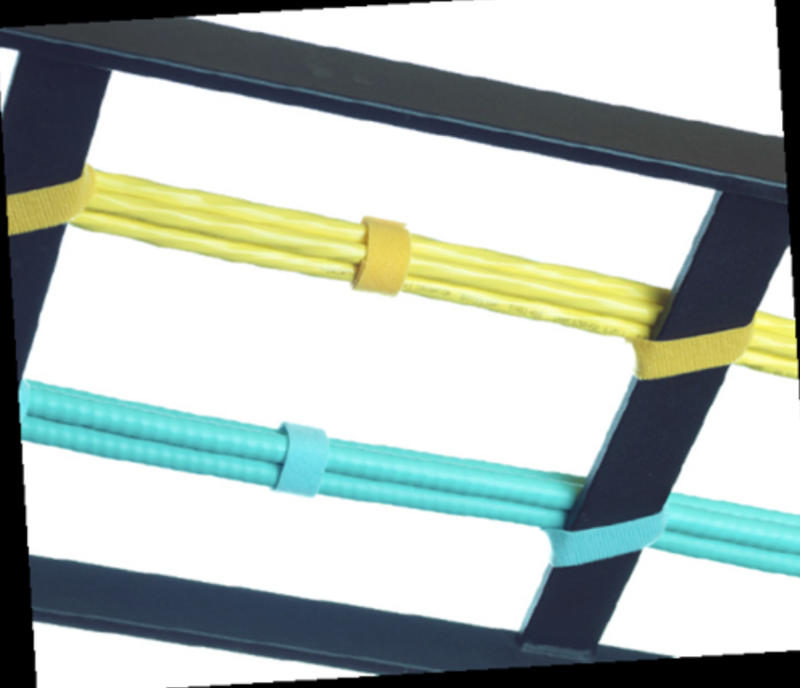 Last year, the VELCO® Brand ONE-WRAP® cable management offering expanded to include colors specific to fiber optic cabling and is now available in orange, aqua, violet and yellow, as well as the traditional standard colors. The expanded ONE-WRAP® strap offerings are color-coordinated and match standard fiber optic cable jackets and are designed to improve fiber network installs at enterprise and campus networks, data centers, long-haul networks and broadband and CATV networks. Prior to cable installation, the ONE-WRAP® rolls and ties can assist in organization when transporting cables to job sites. Once bunched together appropriately using ONE-WRAP® ties, cables can be labeled and arranged accordingly. If cords need to be re-organized and/or re-purposed, the hook-and-loop fastener is easy to unfasten and reuse. Once at the job site, VELCRO® Brand ONE-WRAP® straps are a necessity for a smooth and successful installation. Network cables, electrical cords and other utility cords need to stay affixed to beams, poles or within drywall so they don't present safety hazards or look unsightly. This is critical when it comes to fiber optic cabling, where cables need to be securely attached to wire racks in the ceilings and/or walls. We have seen great success in the use of VELCRO® Brand products at datacomm facilities where "cord chaos" is an understatement. As the fiber optic industry continues to grow, VELCRO® Brand products will be at the forefront of the cable management conversation. Cable management can be quite overwhelming, so let the VELCRO® Brand help you control that "cord chaos." Learn more about cable management and the flagship cable management solution, VELCRO® Brand ONE-WRAP® solutions here. Major telecom and tech companies are installing fiber optic cables in cities all over the country to bring high speed internet to residents and update the aging infrastructure of the U.S., as well as in offices and educational institutions. For installers, managers and data center designers, the term "chaos" is a signficant understatement for the jumble of patch cords they deal with during installation and regular maintenance. For years, VELCRO® Brand ONE-WRAP® Rolls and Ties have proved their value as easy, reusable, safe and adjustable bundling solutions that are gentle on fragile wires, cords and even fresh produce at the grocery. Recognizing a need in fiber optic networks, VELCRO® has designed a new line of ONE-WRAP® Ties specifically for fiber optic cabling. Four new colors - aqua, yellow, orange and Erika violet - correspond to the four main cable jacket colors of fiber optic cables. Avoid injury: Keeping fiber cables bundled and affixed to server racks or hangers helps everyone avoid dangers like tripping, which could cause bodily injury as well as damage fiber optic cables. Eliminate damage to cables: Unlike plastic zip ties, the reusable ONE-WRAP® Ties will not crush the fiber optic cable's fragile glass due to over-tightening. As the ties are pre-cut, there's no need for scissors or other cutting tools that can accidentally damage cables as well. Save money on energy costs: Jumbled cords can actually trap heat by blocking airflow; this means data center managers will need to turn the air conditioning down to keep server racks at optimal temperatures. Organized and bundled cords allow for effective and appropriate airflow. Fix outages faster: The ability to see the entirety of a cable - without needing to untangle it from others - allows network managers to more easily identify problems and make repairs quickly. As an adjustable and turnkey alternative to the plastic zip ties traditionally used in the data center and other fiber optic networks, ONE-WRAP® Ties are pre-cut with a slotted head design that ensures the strap stays tightly secured. They're also water- and chemical-resistant, eco-friendly and made without potentially toxic chemicals often found in plastic (like BPA). Prior to cable installation, the ONE-WRAP® Rolls and Ties can assist in organization when transporting patch cords to job sites. Once organized appropriately using ONE-WRAP® Ties or Rolls, cables can be labeled and arranged accordingly. And if cords need to be reorganized and/or repurposed, ONE-WRAP® Ties are easy to unfasten and reuse. Learn more about cable management and VELCRO®'s flagship cable management solution, VELCRO® Brand ONE-WRAP® Ties here. Introducing the Industrial Trade Range of solutions for construction and commercial applications. This suite of hook-and-loop straps and tape features newly designed packaging that allows professionals to quickly and easily find the perfect products for their structural needs. VELCRO® Brand Nylon Hook 88 Loop 1000: Designed for indoor applications, such as precisely affixing carpet and tiles to a floor or signage to a wall, this powerful fastener features a high-tack acrylic-based adhesive. It is available in 25-yard rolls in black and white, 1", 1 1/2" and 2" widths. VELCRO® Brand Polyester Hook 81 Loop 9000: For general outdoor use applications that require a moderate closure strength with a long lifecycle, polyester hook and loop provides an excellent alternative to nails or screws. 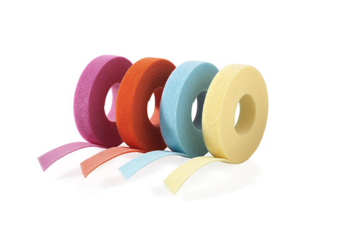 This tape features a rubber-based adhesive designed to adhere to all materials except Vinyl. This fastening solution is available in black 25-yard rolls and 1" and 2" widths. VELCRO® Brand Nylon and Polyethylene ONE-WRAP® Tape: This self-engaging tape is specifically designed for bundling and strapping materials. Fully adjustable and reusable, VELCRO® Brand ONE-WRAP® tape is an eco-conscious alternative to traditional plastic cord management solutions typically used in data server rooms or for office electronics. VELCRO® Brand ONE-WRAP® is available in 25-yard rolls and widths of 1/2", 3/4" and 1". It also allows professionals to avoid the risk of over-tightening and impairing the performance of electrical cords and cables over time. Two inches off on a measurement could cost an entire sheet of material and hardware and could cause potential surface damage with traditional fasteners. VELCRO® Brand adhesive backed fasteners allow the user to re-position material as if it never happened, saving valuable time and materials. VELCRO® Brand's ONE-WRAP® tape is the safe, reusable, adjustable alternative to plastic cable ties, making it a more sustainable product for the environment. Avoid pinching fiber optic cables and degrading their performance. VELCRO® Brand ties do not over tighten. Save time and money by not having to cut and waste plastic ties when wires need to be added, removed or re-positioned. Contact us to start building your ideal VELCRO® solution.